This article is published with the knowledge and consent of M. Santos-Dumont. Because he is resolved not to be drawn into a local controversy, and, more particularly, because he considers himself to be still in the experimental period, M. Santos-Dumont refuses to write any article, popular or technical, or to give diagrams of the inventions with which he is constantly experimenting, and which are, therefore, subject to continual changes. In the following interview, however, the writer, who has been a great deal with him during the past four years, was permitted by M. Santos-Dumont to take down questions and answers in shorthand.—S. H.
Alberto Santos-Dumont, a young Brazilian resident in Paris, after four years of invention, construction, and constant experiment, has been navigat­ing a cigar-shaped balloon with a sixteen horse-power petroleum motor under it, capable of making way against any wind that is less than forty kilometers (twenty-five miles) an hour. What this means may be imagined when it is remembered that a wind of fifty kilometers an hour is called a storm. At the outset, a word should be allowed the inventor concerning two very different factors of his success—inventing and manag­ing a dirigible balloon. Indeed, the factors are three,—inventing, constructing, and managing, —as inventors on paper are likely to discover before they find themselves navigating the air. M. Santos-Dumont has occupied four years with invention and con­struction. Now he is learning to manage the perfected air-ship. "Suppose you buy a new bicycle or auto­mobile," he says. "You will have a .perfect machine to your hand; but it does not neces­sarily mean that you will go spinning with it over the highways. You may be so un­practiced that you fall off the bicycle or blow up the automobile. The machine is all right, but you must learn to run it. That is what I am doing with my air-ship." This is what the crowds of Parisians who have been following M. Santos-Dumont's aerial evolutions take but imperfectly into account; and the readers of the daily papers in far-off lands, who hear of his trials and narrow escapes only by way of garbled and hurriedly written cable dispatches, are still less likely to appreciate it. Everything about the navigation of the air is new; newest of all is the art—practiced only by this daring youth—of diving and mounting obliquely in the air by means of his propeller force. In the complicated and novel task of putting an air-ship through its best paces, much must necessarily be at the mercy of chance de­tails. Thus a trial trip whose start and finish were witnessed by scarcely twenty-five per­sons was much more satisfactory than the succeeding day's official trial before the Technical Committee of the Deutsch Prize Foundation and a brilliant tout-Paris assem­blage. On this occasion (the morning of July 13, 1901) M. Santos-Dumont sped straight through the air above western Paris to the Eiffel Tower, turned round it, and returned to his starting-point, a distance of eleven kilometers (nearly seven miles), in thirty-nine minutes, and this in spite of a new petroleum motor that was discovered to be working imperfectly shortly after starting. The day before, while going over the same course, he found that his right-hand rudder-guide had become loose. This happened near the Eiffel Tower. Without sacrificing a cubic inch of gas, he descended to the ground by means of his shifting-weights; that is to say, he pointed the nose of his cigar-shaped balloon obliquely downward and navigated to the surface of the earth by means of his propeller. There he procured a ladder and repaired his rudder-guide. Then he mounted into the air and resumed his course without sacrificing a pound of ballast; that is to say, he pointed the balloon's nose obliquely upward by means of the shifting-weights, and so navigated on high again by the force of his propeller. To those who know anything about diri­gible balloons, these evolutions, simple as they appear, constitute M. Santos-Dumont's greatest triumph. They have never been accomplished by any other aeronaut. The ease and precision with which he executes them have called forth the special admira­tion of competent authorities. Thus M. Ar­mengaud jeune, the engineer, who, with the late M. Hureau de Villeneuve, was one of the founders of the Societe de Navigation Aerienne, and was for a long time its vice-president, owns frankly: "I can say that what most strikes me is the ease with which M. Santos-Dumont, by inclining his aerostat at will, is able to dive or rise so readily in the air, and thus bring himself on a level with the more favorable layers of the atmosphere by crossing through contrary currents." 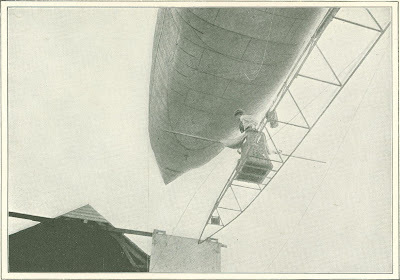 How M. Santos-Dumont made his sensa­tional trips between St. Cloud and the Eiffel Tower, to show Paris what he could do, and incidentally to win the Deutsch Prize of one hundred thousand francs for the first diri­gible balloon or flying-machine that should make the round trip in half an hour, is a matter of common knowledge. At the first official trial he missed winning the prize by only nine minutes. At the second he covered the distance from St. 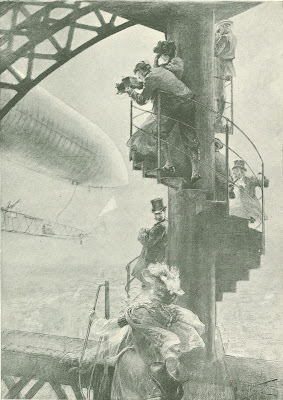 Cloud to the Eiffel Tower in eight minutes fifty seconds, turned the tower in forty seconds more, and in twelve minutes from his start was over the Bois de Boulogne on his return, with eighteen minutes to spare for the short distance remaining, when an accident, which might have been tragic, brought him to the ground with a wrecked air-ship. The fact that M. Santos-Dumont really navigates the air is in itself the all-suf­ficient explanation of the universal chorus of wonderment that has gone up in response to the news of his performances. In Paris they have also excited recriminations from friends of the official military balloonists of the Chalais-Meudon Park, reaching to denial of the new air-ship's novelty of in­vention and superiority of action. These military balloonists have been for many years the supposed possessors of the secret of dirigible ballooning. In a spirit of emula­tion more admirable than their first move­ment of detraction, they now announce the rapid construction of a steerable balloon of their own, expected to offer "great resistance to the wind" and to be "capable of facing any weather." In this way the young in­ventor will have to his honor not only his own performances, but the renewed efforts to which they shall have excited others. As for himself, he is occupied with his new balloon, the "Santos-Dumont No. 6," his perfected model embodying all that he has learned from experimenting with the five which preceded it. This young Brazilian inventor works for the love of the thing, not for lucre. He has never felt moved to apply for a single patent. He is a son of the "Coffee King" of Brazil, the proprietor of the Santos-Dumont plan­tations of Sao Paulo, the friend of the for­mer Emperor Dom Pedro, and the benefactor and adviser of whole populations. Santos-Dumont, the father, although a Brazilian by birth and nationality, was French by descent, and had his technical education at the Ecole Centrale (Arts and Industries) in Paris. Thanks to this education, he was the first to apply scientific methods to Brazilian coffee-culture, so that his plantations be­came the most flourishing in the land, having four million coffee-plants, occupying nine thousand laborers, comprising towns, manufactories, docks, and steamships, and served by one hundred and forty-six miles of private railroads. It was on these railroads that the young Santos-Dumont, before he was twelve years of age, drove locomotive-engines for his pleasure, and developed the taste for mechanics and invention which saved him, coming young and rich to Paris, from a life of mere sporting leisure. Until eighteen years of age, when he completed his education at the University of Rio de Janeiro, he remained in Brazil, always returning in vaca­tion-time to the wild back-country of the plantation, where he became a mighty hunter, killing wild pigs and small tigers by preference, and great snakes out of a sense of duty. Arriving in Europe in 1891, he made a tourist trip and ascended Mont Blanc. A part of 1891 and 1892 he spent between London and Brighton, perfecting his Eng­lish, which he now speaks as well and as often as French; but he always returned to Paris, where in 1892 he was already driving automobiles. In 1894 he made a short trip to the United States, visiting New York, Chicago, and Boston. He did not begin ballooning until 1897, in the summer of which year he made his first ascent in com­pany with the late M. Machuron. In the same year he made twenty other ascensions, a number of them unaccompanied, and be­came a reliable pilot of spherical balloons. He has, indeed, an ideal figure for the sport, uniting remarkable strength, agility, and coolness to his jockey's weight of scarcely one hundred pounds. For this reason he was able to lower the volume of the "Brazil," his first spherical balloon, to the unusual mini­mum of one hundred and thirteen cubic meters. The little "Brazil" was always filled with hydrogen, and after each ascension he never failed to bring it back with him in his valise. This Brazilian has neither the structure, the complexion, nor the exuberant gestures of the men of his country. He is pale, cold, and phlegmatic, even, if the word may be applied to one so active. In his moments of greatest enthusiasm and of most lively disap­pointment he is always the same; and he is as free from affectation as a child. He has a weakness for driving dog-cart tandems, and—something which has had a vital influ­ence over his career as a balloonist—he has been an intrepid automobile chauffeur from the first. He began with a Peugeot roadster of two and a half horse-power. He has since owned and driven half a dozen automobiles of con­tinually increasing speed and power, his longest trip without stop being taken in 1898, between Nice and Paris, and accom­plished with a six horse-power Panhard in fifty-four hours. Latterly he has abandoned petroleum in favor of electricity, in a dainty light-running American buggy manufac­tured in Chicago. It serves him, he says, better than the more troublesome teuf-teuf for his morning spin through the Bois and his afternoon errands from the balloon-maker s at Vaugirard to his apartment in the Avenue des Champs-Elysees, and from the Aero Club's ground at St. Cloud to the Automobile Club in the Place de la Concorde. "I was once enamored of petroleum automo­biles, because of their freedom," he explains. "You can buy the essence everywhere; and so, at a moment's notice, one is at liberty to start off for Rome or St. Petersburg. But when I discovered that I did not want to go to Rome or St. Petersburg, but only to take short trips about Paris, I went in for the electric buggy. "I got my first idea of putting an automobile motor under a cigar-shaped balloon filled with hydrogen gas while returning from the Paris-Amsterdam automobile race in 1897," he said when he began giving me this interview. "From the beginning everybody was against the idea. I was told that an explosive gas-engine would ignite the hydrogen in the balloon above it, and that the resulting ex­plosion would end the experiment with my life. Lachambre, my balloon-constructor, went to work without enthusiasm. So far from others ‘convincing me that their no­tions were worth taking up,’ as has been said, I met with nothing but discourage­ment." Such a categorical statement ought to dispose of the legend of a young "Maecenas of balloon-builders, "who" does not set up himself to invent machines, only to judge of those which inventors bring to him, and of the work done by the mechanics he em­ploys." Colonel Renard's assertion that M. Santos-Dumont is not a man of science, but un sportsman de l'aerostation qui a beau-coup de cranerie (an aerostatic sportsman who has a great deal of swagger), is equally inexact. Sufficiently at home in mathe­matical mechanics to make the calculations which necessarily preceded not only the construction of his various air-ships, but their very idea, sufficiently practiced and ingenious to make his own models, the young inventor owes no more to his constructors and hired mechanics than he does to his theoretical friends. "I ordered my first dirigible balloon from Lachambre in the summer of 1898,"M. Santos-Dumont said. "It was in the form of a cylinder terminated at each end by a cone; it was eighty-two feet long and almost six feet in diameter, with a capacity of sixty-four hundred cubic feet of gas, which gave it a lifting-power of four hundred and fifty pounds. Being of varnished Japanese silk, it weighed only sixty-six pounds. This left me some three hundred and eighty pounds for basket, motor and other machinery, bal­last, and my own weight. 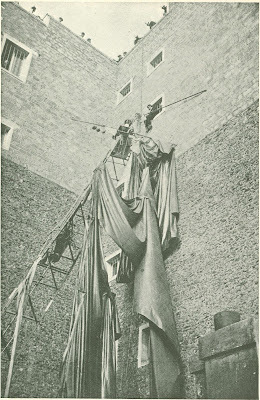 "There was a time when any piece of silk of seemingly good quality was accepted in balloon-construction, without subjecting it to preliminary tension; to-day each piece is experimented with, and if its dynamometric resistance does not attain the number of kilograms necessary to offset the maximum force of gas dilatation, it is pitilessly rejected. It is the same for all ropes and cords; they are tried with the dynamometer up to the greatest strain that may ever come to be put on them." This minute painstaking in the construc­tion of his air-ships has served M. Santos-Dumont to good purpose more than once—most of all in the accident of August 6, 1901, when nothing but a long and slender "keel" of thin pine scantlings and piano-wire, resting its extremities on the roofs of two houses, interposed between him and a fall of eight flights to the ground. "While the balloon envelop was being minutely pieced together," continued M. Santos-Dumont, "I succeeded in getting the rest of the air-ship completed. Hanging be­neath the cigar-shaped balloon, it consisted simply of a light basket containing motor, propeller, ballast, and myself. The motor was one of the De Dion-Bouton tricycles, of an early type, with one cylinder, and giving about one and a half horse-power. You know how they work? Reduced to their greatest simplicity, you may say that there is gasoline in a receptacle. Air passing through it comes out mixed with gasoline gas, ready to ex­plode. You give a whirl to a crank, and the thing begins working automatically. The piston goes down, sucking combined gas and air into the cylinder. Then the piston comes back and compresses it. Then it goes down again, striking an electric spark. There is an immediate explosion; and the piston goes up again, discharging the used-up gas. Thus there was one explosion for every two turns of the piston. In order to get the most power out of the least weight, I joined two of these cylinders end to end, and realized a three and a half horse-power motor." "I have heard that joining end to end spoken of as a most ingenious invention," I said. "I was rather proud of it at the time; but it heated too rapidly, and I abandoned the idea in subsequent constructions. The motor, being fixed at the back of the basket, acted directly on the screw-propeller placed below it, but projecting a few feet out. Basket and machinery weighed one hundred and forty pounds, while I weighed one hun­dred pounds. This left one hundred and forty pounds for ballast and my primitive shifting-weights; for I saw from the begin­ning that if I would navigate the air seriously I must be able to dive and mount without ex­pending gas and ballast. Otherwise the very life of my little air-ship would be oozing away with every evolution. A rope hung down from the fore part of the cigar-shaped bal­loon and another from the after part. I had in the basket with me a rather heavy bag of ballast. When I wished to point the balloon's nose upward, I had only to pull in the after rope and attach the bag of ballast to it. When I wished to point it downward, I had only to pull in the forward rope and attach the bag to it. In either case the center of gravity was changed, and the horizontal cigar-shaped balloon inclined as desired. The device worked well from the first day, and has since become one of the essential features of my air-ship. "My 'Santos-Dumont No. 1,' as I called it, foreseeing that it was going to be the first of a series of constructions, was torn at the start, getting caught in a tree at the Jardin d'Acclimatation. It was from this pleasure-ground in the Bois that I made my first ascents, because it had a gas-plant to serve its own captive balloon. During the second trial, which was successful, the little air-pump on which I depended to keep the bal­loon taut refused to work. Condensation and dilatation are the two enemies of bal­looning, the former causing the gas in the balloon to shrink and the latter to expand too rapidly. Caused by changes in tempera­ture and atmospheric pressure, they continu­ally react upon each other in the ordinary spherical balloon, necessitating continual losses of ballast and gas. "Suppose you are in equilibrium at five hundred meters height. All at once a little cloud, almost imperceptible, masks the sun for a few seconds. The temperature of the gas in your balloon cools down a little; and if, at the very moment, you do not throw out enough ballast to correspond to the ascensional force lost by the condensation of the gas, you will begin descending. Ima­gine that you have thrown out the ballast — just enough, for if you throw too much, you will become too light and go too high. The little cloud ceases to mask the sun. Your gas heats up again to its first temperature and regains its old lifting-power. But, hav­ing less to lift by the amount of ballast thrown out, it now shoots higher into the air, and the gas in the balloon dilates still more, and either escapes through the safety-valve or has to be deliberately sacrificed to prevent the balloon going too high. Then, the balloon having overshot its equilibrium and lost too much gas, it begins descending, to con­dense its gas again, —when more ballast must be sacrificed, and the trouble recom­mences. These montagnes-russes (or 'shoot-the-chutes') vagaries of spherical balloon­ing must be avoided to the utmost with my air-ship. "Thanks to my shifting-weights, I was never obliged to sacrifice gas or ballast to combat them; but condensation and dilatation are, on the other hand, peculiarly dangerous to a cigar-shaped balloon, which absolutely must keep its form. I had, there­fore, placed a little compensating air-balloon inside the other. It was connected with the air-pump by a tube, so that when the cigar-shaped balloon began to shrink, I could, swell it out again by pumping in atmospheric air. Helas! The air-pump refused to work at the critical moment. The balloon began to double on itself as it grew flabby; and soon I was falling at the rate of sixteen feet per second. The air-ship fell thirteen hundred feet to the ground, and it would have ended fatally for me had I not called out to some people who had spontaneously caught hold of my guide-rope to pull hard in the direc­tion opposite to that of the wind. By this maneuver I diminished the final speed of the fall and the worst part of the shock." All his friends remember this sensational trip in the autumn of 1898. The air-ship rose above us in the Jardin d'Acclimatation. For a while we could hear the motor spitting and the propeller churning the air. Then, when he had reached his equilibrium, we could still observe Santos manipulating the machinery and the ropes. Around and around he maneuvered in great circles and figure 8's, showing that he had perfect control of his direction. Then, according to the program, he started in a straight line for the west. As the air-ship grew smaller in the distance, those who had opera-glasses began crying that it was "doubling up." We saw it coming down rapidly, growing larger and larger. Women screamed. Men called hoarsely to one another. Those who had bicycles or automobiles hastened to the spot where he must be dashed to the ground. Yet within an hour M. Santos-Dumont was among his friends again, unhurt, laughing nervously, and explaining all about the unlucky air-pump. "I made a third trial with No. 1, this time with a long rope, like a captive balloon," he continued, "but I saw that I should have to build another. I built it, but never made a proper ascension in it. It was the same type as No. 1, but larger. After a few trials with the rope, I definitely abandoned this long and slender balloon model, so se­ductive from certain points of view, but so dangerous from others. "My No. 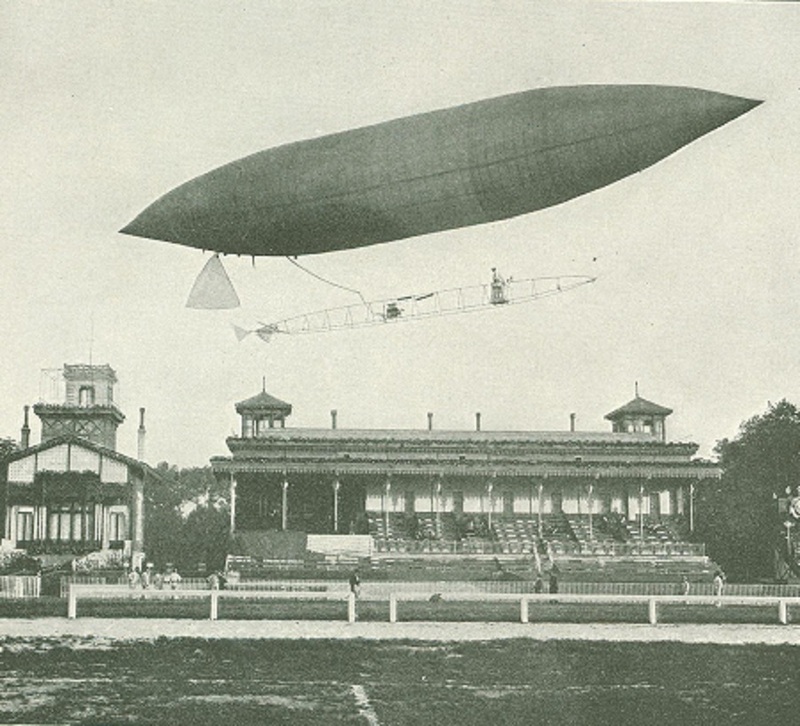 3, which was completed in the summer of 1899, was a shorter and very much thicker balloon, sixty-six feet long and eleven and a half feet in its greatest diam­eter. Its gas capacity was seventeen thou­sand six hundred cubic feet, which gave it three times the lifting-power of No. 1, and twice that of No. 2. On the other hand, I had decided to fill it with common illuminat­ing-gas, whose lifting-power is not nearly so great as that of hydrogen. The hydrogen-plant at the Jardin d'Acclimatation was badly served. It had cost me vexatious delays and no end of trouble. With illumi­nating-gas I should be more free. In this model I also suppressed the compensating air-balloon. I had gone through a bad ex­perience with its air-pump already; and the changed form of the new balloon, so much shorter and thicker, would help to do away with the danger of doubling up. For the rest, I wanted to try the stiffening qualities of a thirty-foot bamboo pole fixed length­wise to the suspension-cords above my head and directly beneath the balloon. "This was my first keel. It supported basket and guide-ropes, and it brought the shifting-weights into play still more effec­tually. "Being filled with ordinary illuminating-gas, the new balloon (No. 3) lifted basket, machinery, my own weight, and two hundred and thirty pounds of ballast— ballast which I might now reserve for great emergencies. "On November 13, 1899, I started from Lachambre's atelier in Vaugirard with the No. 3 on the most successful trip I had yet made. From Vaugirard I went directly to the Champ de Mars, over which I practiced describing figure 8's. The air-ship obeyed the rudder beautifully. After circling round the Eiffel Tower a number of times, I made a straight course to the Parc des Princes at Auteuil; then, making a hook, I navigated to the manoeuver-grounds of Bagatelle, where I landed. At this time, remember, neither I nor the Aero Club had a balloon-pail to start from or return to. To go back to Lachambre's at Vaugirard, surrounded as it is by houses, presented too many dangers. "I made other successful trips in the ‘San­tos-Dumont No. 3,' the last time losing my rudder and landing, luckily, on the plain at Ivry. I did not repair it. The balloon was too clumsy and the motor was too weak. I now had my own 'stable' and gas-plant; and, anxious to profit by past experience, I gave Lachambre the order for my No. 4." "That was the air-ship of the Exposition year and the International Congress of Aeronauts, was it not?" "Yes, the one with the bicycle-saddle." This is also the model with which the foreign public has been made most familiar, because most of the newspapers came out with old cuts and photographs of it during M. Santos-Dumont's sensational trips, with a quite different keel, in July, 1901. In No. 4 the thirty-foot bamboo pole became part of a real keel, no longer hanging above the navigator's head, but amplified by vertical and horizontal cross-pieces and a system of tightly stretched cords. It sustained motor, petroleum-reservoir, propeller, and navigator in a spider-web frame without a basket. It was a daring innovation. The navigator himself must sit on a simple bicycle-saddle in the midst of the spider-web, where the absence of the traditional balloon-basket seemed to leave him astride a pole in the midst of a confusion of ropes, tubes, and machinery. It was more than a bicycle-saddle, how­ever; it was a whole bicycle-frame, around which the inventor had united cords and other means for the controlling of the shift­ing-weights, the striking of the motor's electric spark, the opening and shutting of the balloon's valves, the turning of the water-ballast's spigots, and all the other functions of the air-ship. The rudder, for example, was controlled by the handle-bars; and the propeller was started, as in a petro­­leum tricycle, by working the pedals. Even the bicycle's wheels were put to use for moving the air-ship about on the ground. They were, of course, detachable. "My balloon No. 4," the inventor went on to explain, "was, both in form and capacity, a compromise between No. 3 and its pre­decessors. With a gas-capacity of fourteen thousand eight hundred cubic feet, it was ninety-five feet long and nine feet in its greatest diameter, but no longer a cylinder terminated by two cones. It was, rather elliptical in form, and while not a return to the slender straightness of No. 1, it had so little of No. 3's podgy compactness that I thought it prudent to put the compensating air-balloon inside it again, this time fed by a rotary ventilator of aluminum. Being smaller than No. 3, it would have less lifting-power; but this I made up by going back to hydrogen gas. "A new seven horse-power two-cylinder motor, made for me by Bouchet, turned the propeller at the rate of one hun­dred revolutions per minute, furnishing a traction effort of sixty-six pounds. It made a great improvement in my speed, and for two weeks during the summer of 1900 I enjoyed, almost daily, what seemed to me then ideal trips. On September 19 I made a kind of official trial in presence of the International Congress of Aeronauts, and received the felicitations of its members, among whom came later Professor Langley of the Smithsonian Institution. "By this time I felt that I had gained enough experience to justify materially in­creasing my motive power, and a new type of sixteen horse-power motor with refroi­dissement a ailettes (i.e., without water-jacket) having just been created, I set about adapt­ing it to the air-ship. It had four cylinders instead of two. This increased the weight to be lifted to such an extent that I must either construct a new balloon or enlarge the old one. I tried the latter course. Cut­ting the balloon in half, I had a piece put in, as you put a new leaf in an extension-table; and the length was thus brought to one hun­dred and nine feet. I then found that my balloon-shed was too short by ten feet. "In prevision of a 'Santos-Dumont No. 5,' I added thirteen feet to the shed. Motor, balloon, and shed were transformed in fifteen days. It was wasted pains, for no sooner had I got the enlarged balloon filled with hydrogen than the autumn rains set in. After two weeks of the worst possible wea­ther, I let out the hydrogen and began experimenting with the motor and propeller from a fixed point. This was not lost time; for bringing the speed up to one hundred and forty turns per minute, I realized one hundred and twenty-one pounds of traction. In truth, the motor turned the propeller with such force that I contracted pneumonia in the current of air, and found myself laid up for the winter." "Then you went to Monte Carlo?" "Yes. I cured myself automobiling in the mistral. At the same time I found a broad- minded carpenter at Nice who, for a consideration, allowed me to work out a new idea in his atelier. The idea took the form of my present keel, a long triangular-sectioned pine framework, of great lightness and rigidity, sixty feet in length and weigh­ing only ninety pounds. Its joints were in, aluminum, and its rigidity was reinforced by tightly drawn piano-wires. Into this keel, twenty feet from the stern, I fixed the new sixteen horse-power four-cylinder motor, connecting it with the propeller by a long hollow steel shaft. My own place was in a very light basket, twenty-three feet from the front or stem. "In one way this was a disadvantage, for I had now to command the motor at a distance by means of cords. I could not put it in movement en route, although I could stop it. For this reason I longed for the bicycle-frame's pedals of No. 3; and I am still studying a device to replace them. In all other respects, however, the new keel was a great improvement, distributing the weight and lending great tautness to the balloon above it. "The interior air-balloon I now retained definitely, it being fed by an aluminum ventilator. Both balloon and air-balloon were furnished with valves whose springs, of unequal force, were so arranged that in case of an excess of pressure the air, and not the gas, would first escape. Valves, motor, fuel-reservoir, rudder, and all other functions of the air-ship were connected with my little basket by means of ropes and pulleys. I will not deny that it required coolness and ex­perience to handle them. Still, at the worst, I could always climb out and along the frame­work of the keel to the spot needing attention. "You know what the end of my No. 5 was. In the early morning of August 8, having called together the Technical Com­mittee of the Deutsch Foundation, I navi­gated from St. Cloud to the Eiffel Tower in eight minutes and fifty seconds, turned round the tower in forty seconds more, and was just reaching the Bois on the home stretch, with eighteen minutes to the good, when the ca­tastrophe happened. The balloon had al­ready begun losing gas before I reached the tower. "Had I not been making a kind of official trial, I should have returned to the shed to examine the balloon. Going round the tower it was manifestly deflated; but I had made such good speed that I risked continuing. I had not been four minutes on the home stretch, however, when the balloon began swinging like an elephant's trunk, it was so flabby. I felt myself falling, and was about to switch the motor-power to the air-pump to stiffen it out again, and so come to earth as gently as possible, when the aft ropes, losing their rigidity, caught in the pro­peller. I stopped the propeller instantly. The rapidly emptying balloon now obeyed no­thing but the vagrant winds. I came down, without much of a shock, between the roofs of the Trocadero hotels, the balloon ripping up with the noise of an explosion. The new keel saved my life. Its two extrem­ities rested on the two roofs, one lower than the other; and there I hung, sustained by the keel, until I could be pulled up to the higher roof by means of a rope." "Do you know the cause of the acci­dent?" I asked. "I am not certain of it yet," he answered, "though I suspect the automatic valves, whose reacting on each other is a very deli­cate affair. Or it may have been the interior air-balloon that refused to fill out properly. Yesterday Lachambre's man came to me for the plans of the air-balloon for my No. 6. From something he said I gathered that the air-balloon of No. 5, not having been given time for its varnish to dry before being ad­justed, might have stuck together or to the side of the outer balloon. Next time we shall be more careful, although with so many things to think of, and all new, it is scarcely human not to overlook something." “In what will No. 6 differ from its prede­cessors?" I asked. "It will be, longer, thicker, and conse­quently of considerably greater gas-capacity than No. 5, and more closely ellipsoidal in form. In it I shall try to take advantage of all past experience, even the most unpleas­ant—which is not always the least valuable." "So far you have done everything alone," I said. "Shall you be prepared to take up a passenger in No. 6?" "I want more weight-carrying power in order to take up more petroleum and a passenger—that is to say, an aid. There is a great deal of work, really too much for one man, and up in the air, whatever must be done must be done promptly. But I shall not want a nervous passenger, a fearful passenger, or even a useless passenger. Also I want more motive power for my propeller; for when I have obtained a more complete mastery of the air-ship I shall wish to begin the great battle with the wind. But, as a model, I consider my Nos. 5 and 6 already perfect. The rudder, which was the last part to persist in giving trouble, now works beautifully." "BEFORE we get any further," was my next question, "what do you consider you have accomplished?" "Everything I set out to accomplish. I have gone up dozens of times and, in the presence of half Paris, I have followed the route laid down in advance and returned to my starting-point. I was nine minutes late in my first trial for the Deutsch Prize. Put this down to the poor work of a motor which had, nevertheless, worked well the day be­fore— petroleum motors are like the ladies, capricious, and nobody knows what to do with them. But look at the Paris-Berlin automobile race," he continued with anima­tion; and here M. Santos-Dumont gave what is almost a complete general answer to all the criticisms made concerning his experi­ments. "Of the one hundred and seventy automobiles registered for it, only one hun­dred and nine completed the first day's run, and of these only twenty-six got to Berlin. The others broke down or stopped on the way. And of the twenty-six arriving, how many do you imagine made the trip without a serious accident? It is perfectly natural, and people think nothing of it. But if I break down while up in the air, I cannot stop for repairs— I must go on." "Many people will ask why you select favorable days when you have an air-ship capable of making way against any wind less than forty kilometers an hour." "I am waiting until practice shall make me a better navigator. Do you think I want to break the air-ship often?" he inquired—"never mind what it has cost me, or the value of the Deutsch Prize, or my labors, my disappointments and hopes, and the pleasure the balloon gives me every time I take it into the air? Suppose I am obliged-to land in Paris; how many of those great chimney-pots might I not bring down on people's heads before I came to ground, say, in a public square? I cannot get a com­pany to insure me against the damage I might do on a squally day. Then there is danger in bringing the inflated bal­loon out of its shed on a windy day. The grounds are small and encumbered, nothing like the grounds of a balloon club of the future, when clear, wide, elevated terraces will be considered essential to the aerial navigator's safety and convenience." "I expect the great contest now will be the battle with the air," I said. "I have seen you go against it." "One scarcely goes 'against' the wind in a balloon," replied M. Santos-Dumont. "You are in the wind itself; you are part of it, and so you do not feel it blowing against you. The old adage, "Il n'y a pas de vent en ballon," is not completely true, because a streamer attached even to a spherical balloon will sometimes flutter, while if there were no wind at all, it would point to the ground; but the saying is true enough for practical purposes. The navigation of the air, for me, is like the navigation of a river," he went on. "It is not like the navigation of the ocean; and to talk about 'tacking' is a mistake. With my propeller pushing me at the rate of, say, thirty miles an hour, I am in the position of a river-steamboat captain whose propeller is driving him up or down the river at the rate of thirty miles an hour. Suppose the current to be ten miles an hour. When he goes up-stream he will accomplish thirty less ten, or twenty miles an hour with respect to the land. When he goes down-stream he will accomplish thirty plus ten, or forty miles an hour with respect to the shore. It is the same in the air, a question of plus or minus. Like any river-steamboat captain, I would prefer to go with the current or navigate the calm, say, of a lake; but when the time comes that I must navigate 'up-stream' I will do it. I have done it." At the Chalais-Meudon Military Balloon Park they have gathered statistics of the wind over Paris. In every instance its force was measured by means of a registering anemometer situated on the plateau of Chatil­lon, at the summit of a mast ninety-two feet high. Thus it has been found that the winds vary from five and a half miles to one hundred miles an hour; but as a wind of a hundred miles an hour has been noted only once in eleven thousand six hundred and forty-nine hours of observation, analysis of the data has shown that a dirigible balloon pos­sessing a speed of its own of forty-five kilometers (twenty-eight miles) an hour will be able to navigate the air above Paris eight hundred and fifteen times out of a thousand, and make almost six miles an hour straight ahead in the wind seven hundred and eight times out of a thousand. The military balloonists, therefore, conclude that: "The con­quest of the air will be practically accomplished on the day when there shall be constructed a dirigible balloon having a speed of forty-five kilometers an hour and able to sustain this speed all day." "What was your speed with No. 5?" I asked of M. Santos-Dumont. "Forty kilometers an hour," he replied, without expressing an opinion of the above figures which I cited; "and my No. 6 will be still more powerful." "M. Henry Deutsch is building a sixty horse-power air-ship modeled on your own," I suggested. "He ought to get great speed out of it. What do you think of it?" "Yes, it ought to furnish great speed," he answered; "but I think it too much for anyone to begin with. Such a balloon will be sixty yards long, where mine, after four years of growth based on experience, is still only thirty-five yards long. In every way it will be hard for a beginner to manage. I am afraid M. Deutsch will not be able to get anyone to drive it. So far every pro­fessional chauffeur has refused to go up with him. ‘To think that they are willing to risk their necks daily on the highways,’ he ex­claims, `and yet they are afraid to go a few hundred feet into the air!" "But shall you never build a sixty horse­power dirigible balloon yourself?" "Why not? And why not one of six hun­dred horse-power? My experience demon­strates that the thing itself is practicable; then why not go on improving in mere size and strength?" From the Century Magazine, 1901.